The city of Nafplio is known as all the above names and some more to boot. The first capital of independent Greece, Nafplion is a magical, romantic, historical town with heaps of things to see and do, all just a stone’s throw from Leto Neuvo Hotel. 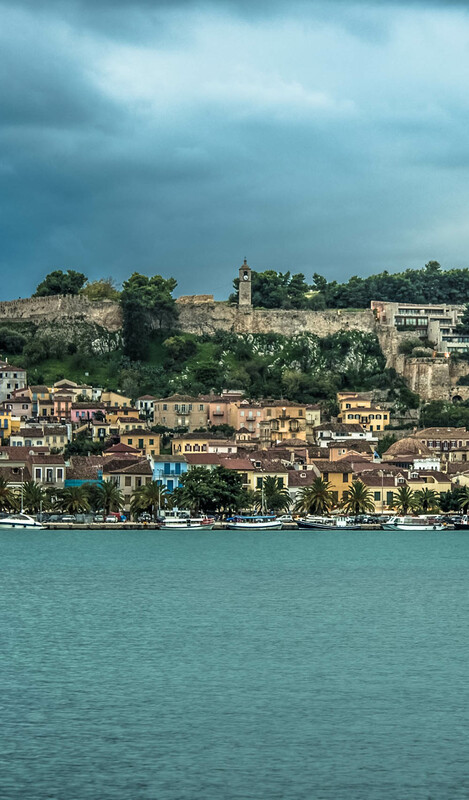 A cosmopolitan town, Nafplio is not restricted to a summer season and is busy with tourists all year round. Due to its ideal geographical situation it is frequented by weekenders from Athens (just a two hours away) Summer & Winter as well as tourists from all over the world. The climate in Nafplion is mild and therefore perfect for holidays in Greece any month of the year. Many people visiting, after exploring the lovely town, historical monuments and castles, use Nafplio as a base to visit some of the wonders of the Argolida county and more generally the Peloponnese. Its central location means that it is possible to reach to furthest point of the Peloponnese peninsula and return as a day trip. Visit the Bourtzi castle in the harbour (probably the most photographed castle in Greece), the Palamidi castle that overlooks the whole town (999 steps up for the adventurous or a two minute car ride for those who are not), and the Acronafplia castle that used to be linked to the Bourtzi in the harbour by chain for defence purposes. Nafplio was occupied by the Franks, the Venetians and the Turkish and this is evident in the architecture of the town, the old mosque just off hte square and the overhangin balconies all through the narrow streets of the old town left over from the Ventians. See the Vouleftikon, the first parliament building of the freed Greece, the Venetian Headquarters and arsenal, now the archeological museum, St Spyridon church, (1702) where the first governor of Greece, Theodoros Kolokotroni, was killed, complete with the bullet, The churches of St George, (17th century), the metropolis of the town, St Nikolaos, (18th century), the Jami, orignally a mosque and now used as a theatre, the Frangoekklisia. Just a short walk from the town, the beach is rocky and is known by the locals as the “town beach” where many locals pop around for a quick dip.. again the water is pristine and although rocky it is favoured by many. Quieter than Karathona (except for July & August) it is a convenient beach for a great swim and sunbathe. Quite a few steps so really suitable for people with wheelchairs or walking difficulties. The area named “Banieres” means baths and it refers to part of Nafplio Yacht Club’s facilities. It is more of concrete jetty than a beach but it is used by many locals and also tourists on a tight schedule that would like to have a swim. There a number of beaches in Nafplion to choose from and even more followig the coast around. There is something for everyone whether interested in sunbathing and swimming, snorkelling. water sports, a quick dip to cool off or a nice walk in the evening. The sea is pristine clean and you are able to see the classic Greek blue-green colour right through to the bottom. Nafplion’s main beach is called Karathona. It is a few minutes by car or by local bus during the Summer months from Leto Nuevo Hotel and it is a Blue Flag beach. The beach follows the horse-shoe shaped bay around the coast making it sheltered and fairly shallow. It is ideal for a day at the beach and is well organised with a number of bars and cafeterias placed at intervals offering a great range of drinks and snacks and patrons are able to use the sunbeds and chairs free of charge. There is plenty of free space to put down your towel and enjoy the sand. Water sports are available here with or without tuition. Neraki beach is a well kept secret (not any more) that it hidden from public view and only accessible by foot. The ‘gyro” of Arvanitia is a pathway that leads from the end of the harbour around the cliffs to Karathona beach, passing Arvanitia beach. About half way around the cliffs Neraki is located. A beautiful quiet little beach, rocky and ideal for swimming. The Tolo beach stretches for about one kilometexrs starting from the beach ” Psili Ammos ” and ending in the small picturesque village port where the fishing boats and various excursion boats will always see tied. The beach location and infrastructure combines the opportunity for swimming, relaxing on the beach and enjoying a coffee , drink or food near the sea , as along it you will find traditional taverns , cafes and bars. At the same time you can find various accommodations that offer the ultimate view of the Argolic Gulf with their balconies a breath away from the sea . The sea is shallow mainly sandy with a few points pebble ideal for children with warm and clear water.